Owing to our expertise in this domain, we are engaged in providing an range of Rose Fragrance Body Spray. Keeping in sync with time, we are able to offer Men's Body Deodorant to our patrons. 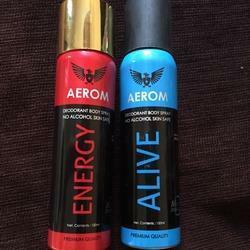 We provide some of the best collection of deodorants in the industry. They are available in the choicest selection of fragrances. Suitable for men, our products are long lasting and have been tested for skin-friendly attributes. We offer very reasonable prices and our delivery is always on time. Backed with expertise we are engaged in offering our customers large variety of Deodorant Spray. Your search ends here for a powerful strong antibacterial deodorant. REVO deodarant spray is water based and contains no aerosol, guaranteeing ample application with every spray.